Listoke 1777 – Just the Tonic! Imagine arriving at school – only to be met at the door with a G&T? It might sound too good to be true but it’s actually 100% accurate – at least for the lucky students attending the new Gin School now operating in a former barn and stable block on the grounds of an historic Drogheda mansion! The school and its adjoining distillery is the brainchild of three enterprising couples who launched the initiative in the grounds of historic Listoke House in Co Louth last autumn. In January of this year they launched their very first craft gin – Listoke, 1777. The gin is already being distributed throughout Ireland and is expected to make quite a splash when it hits the UK and the USA markets over next summer and autumn. A former nurse and midwife, Bronagh Conroy is Managing Director of the distillery. After spending 10 years in nursing, her life-long interest in food, combined with a strong entrepreneurial streak, led her to the food industry and the establishment of a number of food and drink businesses. After founding and selling The Real Irish Food Company in 2005, Bronagh later worked with the Enterprise Boards as a mentor, and, later still, founded two poteen companies. It was her experience with distilling that was a strong deciding factor in her willingness to drive this latest business initiative with her businessman husband Sean MacDhuibhinse, and two other couples; old friends Raymond and Juliet Gogan and James McKenna and his wife Blanaid, who had owned a number of pubs in the States but had recently returned fulltime to Ireland. The three couples had all decided they wanted to do something new and different. Bronagh, who knew about distilling from her experience in the poteen industry, had come across the concept of a gin school in the UK some years earlier and had, she recalls now, stored the idea at the back of her head. 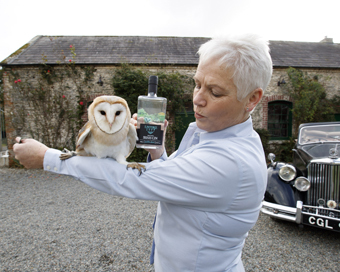 When James expressed a belief that there was a good marketing opportunity in the US for craft gin – and with Juliet and Raymond offering the picturesque grounds of the Listoke estate just a few miles outside Drogheda – the decision was inevitable. Listoke, a 200-year-old mansion with 10 acres of walled gardens, forest and wild gardens, had a spacious stable block and barn, which were efficiently renovated into a state-of-the-art distillery and gin school. The school opened its doors last September to what has turned out to be a virtually non-stop series of enthusiastic students interested in learning a little about the history of gin and Listoke – and a lot about how to make their own gin! A few weeks later, in October, the distillery was opened, and craft gin Listoke 1777 formally entered the market in January of this year. Their special recipe contains the core ‘Holy Trinity’ gin ingredients of juniper, angelica and coriander. It also contains orange, jasmine and rowan-berry along with a number of secret elements which Bronagh firmly refuses to reveal. Things have been going exceedingly well – the Gin School is booked out ‘til May and they’ve even had to put on extra classes to cope with the demand, much of it from the corporate, hen and birthday sectors, mentions Bronagh. Listoke is not just about the gin school – visitors can also enjoy its sprawling gardens, where some of the botanicals are grown; the tea-rooms and an art gallery. The success of the venture is also, of course, not surprising given Juliet’s Gogan’s family tree. Her ancestors include the renowned whiskey magnate John Jameson, who married Margaret Haig of the Scottish whiskey family, while other relations include the Steins, also based in Scotland, who released their white whiskey in 1777. This white whiskey formed an essential part of London Dry Gin – and, many centuries later, helped inspire the name of a descendant’s craft gin! “There’s a whole wealth of knowhow and experience behind Listoke 1777 and it’s all hands on deck,” declares Bronagh confidently.